Have an unlimited MetroCard? You ride for free! $2.75 pay per ride fare. When municipalities hold fairs and parades on streets that carry bus routes, riders are abandoned, with no idea why or what to do about it. 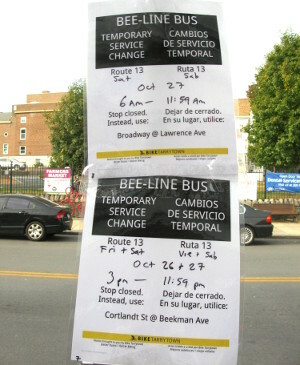 So we've been posting notices at bus stops to let people know about these temporary route changes and where they can catch the bus. We're lobbying Westchester County to take on this important responsibility. And they're stepping up, a bit. If given two weeks notice, they'll put advisories on their website and produce service change notices which municipalities can print and post. Some events result in passengers being taken up to the lakes then down 448, totally missing the train station as well as downtown Tarrytown and Sleepy Hollow. Other events mean buses get stalled out in Halloween traffic on Broadway. Not only does this strand Sleepy Hollow and Tarrytown residents, employees and employers, these delays mess up schedules for everyone up and down the line. 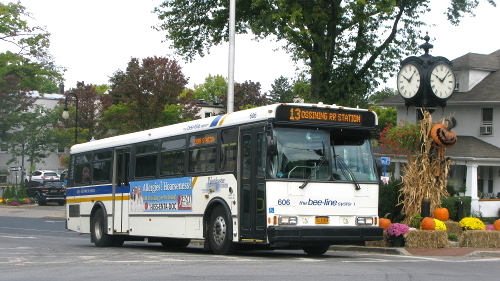 Instead, buses should be allowed to use Pocantico St and Chestnut St during special events. To this end, we wrote a letter to the Sleepy Hollow St. Patrick's Day Parade Committee requesting the grandstand be moved from Pocantico St to Washington St so buses can get through, thus allowing everyone to get where they're expecting to go. 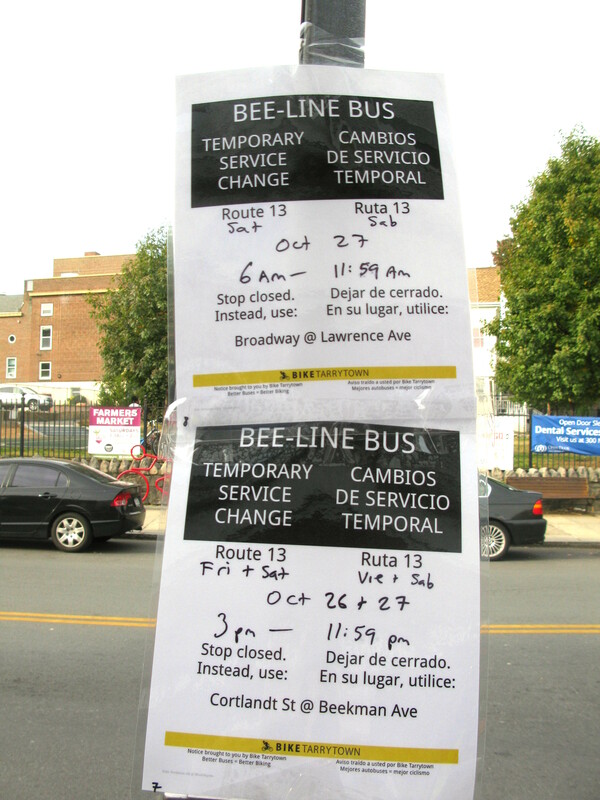 When buses come frequently, people use them more because they don't have to worry about schedules. 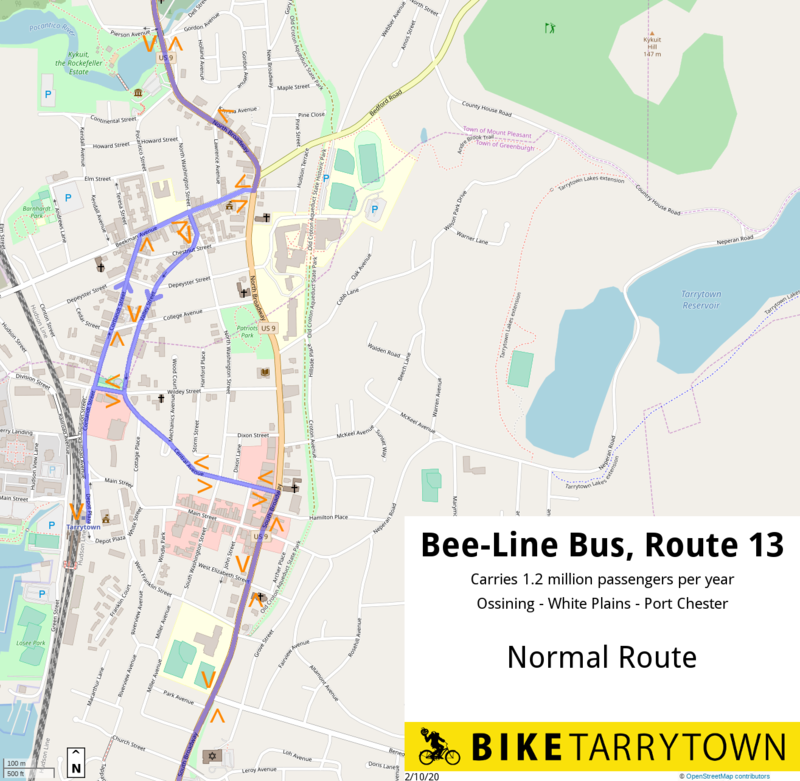 One of our recommendations to Sleepy Hollow's Comprehensive Plan establish 15 minute headways on the Route 13 Bee-Line bus. In both Tarrtyown and Sleepy Hollow, there is significant interest in establishing a shuttle service to get people around in the villages. 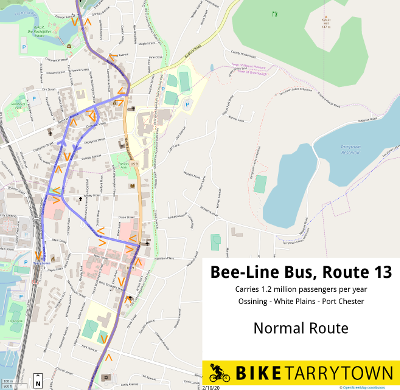 If the Route 13 ran every 15 minutes, that is the shuttle service.